WITH their shrill shouts mingling with the booming of the attackers the Hairy men began to hurl stones and spears down upon the horde of repulsive creatures. The air was thick with flying missiles. Even the women and children took part in the encounter, throwing stones almost as accurately as the men. But even the terrific avalanche that the Hairy people launched did not serve entirely to stern the fury of the gorillas' attack. There were hundreds of them and they swarmed about the base of the cliff and scrambled up its craggy surface with the same agility that they climbed trees, and they came so thick and fast that the Hairy men could not beat them back. But they did punish them severely, for under the direction of Kug and Rab the Hairy men developed a certain strategy in their defense. They waited until the little groups of invaders had climbed half-way up the cliffs, then they shoved several big boulders over the edge and watched them go hurtling down the side sweeping the gorillas off the surface of the cliff like flies and crushing or mangling them at the bottom. But the gorillas were not without some instinctive intelligence which was evident in their attack, for after a time they stopped advancing in groups. Instead, one at a time they scrambled up the steep stone surface of the cliff and darted into one of the hundreds of caves in which the Hairy people dwelt. Here they waited a little while; then venturing out they darted a little higher on the cliff and dodged into other caves. In this way they escaped a great many of the terrible crushing stones hurled at them and gradually worked their way toward the top. The cliff swarmed with them. All the caves were crowded with them. They hid in every niche and crevice, and the Hairy people, seeing them come on relentlessly; seeing their ugly faces, with their wicked inhuman eyes; hearing their persistent booming war-cry; and seeing them working their way gradually to the top; to their stronghold; to their last defenses, trembled and grew frightened. Already the women and children had been sent away, back deep into the forest to hide in a huge cave not far from the old volcano. The warriors now were massing for their last stand on the very cliff edge. With stone hammers held ready and spears leveled they crouched waiting. Already big, sinister hands and long, powerful arms were reaching over the edge as the foremost of the climbing gorillas reached the top and with snarls of rage attempted to drag themselves over and onto the flat top, there to grapple with the smaller and weaker Hairy men. Kug and Ric, crouching together at the very edge, saw a long, hairy arm and great clutching hand reach over, and an instant later a great misshapen head and ugly face appeared before them. With a scream of rage both of them crashed their stone hammers down upon the gorilla's skull and had the satisfaction of seeing an expression of pain and horror over-spread his countenance as his great hands convulsively loosed their grasp and his body fell backward and went hurtling down through space, down to crash at the foot of the cliff in a lifeless heap. Further on another long arm reached over and groping about seized the ankle of Chuk, an old warrior. With a scream of terror the Hairy man lifted a huge rock above his head and crashed it full in the face that followed the arm aver the edge, but the strong hand did not lose its hold as the gorilla-man with a groan dropped backward, and poor Chuk, screaming and clutching, was dragged over the edge to go falling through space with him and crash to a horrible death at the bottom. The defenders were fighting with desperation born of the certain knowledge that if they weakened they would all suffer a horrible fate. They knew that the colony would be wiped out and most of them would furnish food for these cannibalistic invaders. All along the edge of the cliff the struggle raged, the Hairy men with their stone hammers crushing every head that appeared. They had ceased their yelling now, for they were all panting for breath with the exertion of the struggle. They were all worried too, for despite their strong resistance and the many gorillas that they had killed still the invaders came on. More and more swarmed up to the cliffside like so many huge ants. There seemed to he no end to them. Beating them back was well nigh a hopeless task. Already the Hairy men were exhausted with their efforts, but still the ugly invaders kept pressing upward. Kug and Ric and Tug and all the rest of them realized, with great fear clutching at their hearts, that the end was very near. OG, HIS head aching and with a very unpleasant taste in his mouth, opened his eyes and sat up. It was hard for him to realize at first where he was, but suddenly with terrible vividness his struggle out of the pocket filled with poisoned air came back to him, and he realized then that somehow he had managed to drag himself and the unconscious Ru beyond the heavy gas area and into the pure, clean air before he had collapsed. He looked about for Ru and found him lying in a huddled heap among the rocks. Getting to his feet he went over to him and examined him closely, and as he bent over him he saw his companion's eyelids flutter, then slowly open. Presently, looking wildly about, he sat up. Then as he recognized Og he gave a glad cry and scrambled to his feet, and despite the dizziness that they both felt and a lack of strength that caused them to wabble unsteadily, they moved away from the entrance to that deadly little valley at the foot of the old volcano. Ru listened and a look of fear came into his eyes. "It is the gorillas," he cried, as recollections of their adventures down the great river when they had been the captives of the hideous cannibals flashed through his brain. "They are at the cliffs! Are they raiding the colony?" cried Og. Then, gripping their spears, their weakness forgotten, they started to run down the rocky slope and through the strip of forest toward the cliff village, for loud across the distance came the resonant booming battle-cry of the cannibals while fainter and with less power echoed the cries of the Hairy men. Og and Ru pressed on, and soon they beheld fleeting forms among the trees and they discovered the women and children of their tribe hurrying toward the great crave there to take refuge while the Hairy men defended their cliff abode against the invaders. From the refugees Og and Ru learned of all that had transpired in their brief absence and of how the gorillas were swarning up the cliffside trying to conquer and capture the Hairy men. And when they heard this, despite the fear and dread in which they held the brutes who came from beyond the great swamp, they hurried forward. On they pushed, running as swiftly as their short legs would carry there, until soon they came out of the forest again and unto the level rock-strewn shelf that formed the top of the cliff. In a glance they saw how terrible the situation was. Lined along the edge of the cliff were all the hunters and warriors of the tribe hurling stones and spears and swinging their stone hammers with the desperation borne of the fear that these monsters inspired. Even as they rushed to join the defenders they saw a great arm reach over the cliff's edge and clutch a Hairy man by the ankle to drag him kicking and squirming over the brink to a horrible death. Og and Ru, almost unnoticed, hurled themselves into the encounter with vicious energy, defending the cliff with darting spears and crashing hammers. But as they fought there leaped to Og's brain an idea, that made him cease his efforts for a moment while he fell back out of the turmoil to think. And as he strove to correlate his ideas suddenly there burst upon him a bit of strategy worthy of a better brain than that of a Hairy man. Og did not fight after that. Instead he slipped to Ru's side and communicated to him his plan. Then together they rushed from one man to another and told them just what to do. MOST of them remained at the cliff's edge beating back the gorillas, but a group of the strongest among them Og and Ru marshaled in separate crews and started them at the task of moving toward the edge of the cliff as many large boulders as they could find. Stone after stone they trundled up to the edge and left it balanced and ready to be pushed over, and finally when they had the entire edge of the cliff well covered with heavy boulders Og peered over the side. Below him on the face of the cliff he saw hundreds of the gorillas swarming in and out of the caves and climbing about the surface of the rocks. Springing back he cried out a command. Every Hairy man put by his stone hammer and spear then and leaped to the boulders and in a cloud of dust and pebbles the whole line of stones crashed over the lip of the cliff and went whirling down the face, crunching, grinding, crushing. the gorillas in their path, and driving those who were not injured or swept off the cliff back into the safety of the caves. Then while all the warriors gathered in a group and at their swiftest pace followed Ru, Og stayed behind and watched over the cliff's edge to witness the horrible effect of the avalanche of stones and to see how long the gorillas stayed in the safety of the cave. That had been a telling blow; a veritable torrent of death and destruction. Og could see scores of gorillas at the foot of the cliff writhing and squirming in pain. Some were dragging themselves off toward the forest, bruised and bleeding and with broken, useless limbs, and many lay huddled, crushed and lifeless at the bottom who would never move again. 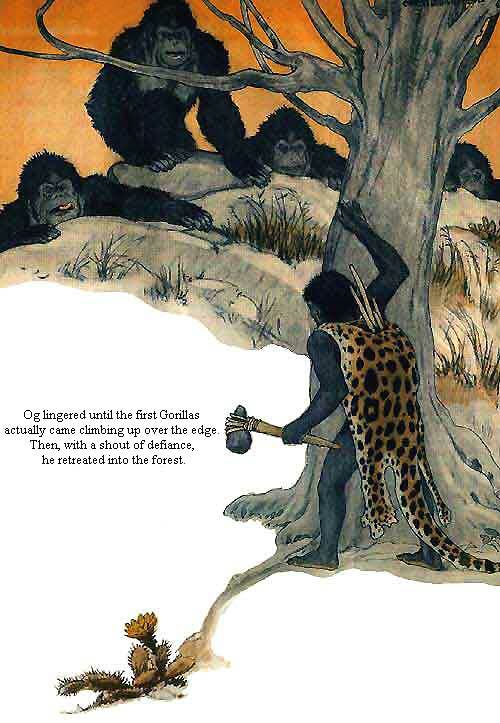 But Og could see heads appearing and reappearing at the entrance of many of the caves and he knew that scores of gorillas had escaped to the caves, and were only waiting until they felt it safe to come out once more and storm the cliff. But they were very cautious now. They waited a long time and that was just what Og had been hoping for, because it gave Ru and the men that followed him time to get a good start toward the old volcano and its treacherous little valley of death. Indeed, Ru was able to lead his band well through the forest and out into the rocky open space that surrounded the old volcano and post them to his satisfaction before he heard from afar the renewed booming of the voices of the gorillas. The strongest and bravest of his followers Ru stationed on either side of the entrance to the little valley, hiding them behind rocks and chunks of hardened lava and warning them to remain hidden until he should give them a signal. But the larger part of the band he led up around the slope of the mountain skirting one side of the treacherous pocket in the rocks until he reached the end opposite to the one at which the rhinoceros and the hyenas had entered. There in full sight on a rocky eminence he posted them to await developments. 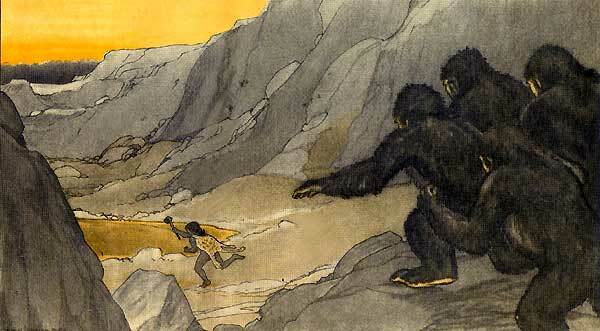 Og meanwhile lingered at the cliff's edge, lingered until he saw the gorillas begin to come out of the caves again. And when they found no more stones were dropped on them and that all was silent above they began their booming battle cries once more and began to climb the face of the cliff. Og fell back then; back to the edge of the forest where he waited until the first of the cannibals climbed over the edge of the cliff and looked about. Then Og, with shouts of defiance and brandishing his spear at them, turned and plunged into the forest knowing full well that very soon the band of giants would be after him. Nor was he mistaken. Following close on the heels of the first one over the edge of the cliff came several others and as they saw Og disappearing into the forest they beat their chests and sounded their hideous, booming noise and gave chase. They thought, as Og hoped they would, that he was a straggler, the last of the band who had taken refuge in the forest and they were elated, for they knew that among the trees they could run down all of the Hairy men and capture or kill them one by one. Og realized that once these great creatures had gained the trees he would have to move swiftly over the ground to outdistance them and so he ran as never before. Soon he heard behind him the crashing and swishing of branches and glancing over his shoulder he could see that the forest was full of vague, sinister shapes that swung swiftly from one swaying limb to another making toward him with terrific speed. Og exerted every bit of energy he had then and despite the fact that he was panting from his efforts his feet fairly flew over the ground. He knew they were gaining on him. He could hear their voices only just behind him it seemed. He could almost feel them at his back and he did not know what moment one of them would come hurtling out of the trees to pounce upon his shoulders and bear him to the ground there to strangle him in its deadly grasp. And then just when he began to feel that he could not hold his mad speed much longer he burst clear of the forest and out into the open on the slopes of the old volcano. A hasty glance showed him that Ru had posted his warriors well and that they were carefully hidden, and through the entrance to the deadly little valley and beyond across the still pool on the farther side, massed on a shelf of overhanging rock, he could see the remainder of the tribe ready and waiting. So far all was well but Og realized that the hardest ordeal for him was yet to come. He must decoy them into the gas-pocket. Glancing over his shoulder he could see the great gorillas swinging down from the trees thoroughly enraged now, for they realized that they would have to follow the fugitive on foot over the rocks and their short, under-developed legs were not meant for this sort of work. However, seeing the rest of the tribe at bay and so chose at hand must have heartened them, for in their shambling way they began to scramble over rocks and boulders using their long arms to help them in their awkward running. But here they were no match for Og who even slackened his pace and still kept well ahead of them. speeding down toward the pool in the deadly valley. Up the slope Og hurried to the very entrance of the little valley. Then on the threshold of that trap of death he paused a moment while he filled his lungs with pure, clean air. Holding his breath he plunged into it. Through the valley he sped, past the carcasses of the hyenas and the rhinoceros and on down toward the clear pool. Skirting the shores of this he hurried with unslackened speed, and though he could hold his breath no longer he was careful not to breathe too deeply of the deadly air. He had traversed three-quarters of the terrible gas-pocket ere a sense of giddiness came over him. Grimly, doggedly he fought it off and spurred himself onward. He had not far to go now. Only a short distance; a very short distance. He must hold out. He must reach the shelf on which his people stood. He must not stagger. He must keep straight on, for if he should go down now, there would be no hope for him and perhaps he might arouse the suspicions of the gorillas and they would not follow him. On he pressed. He was scrambling up the steep slope to the shelf. The air was getting purer, sweeter, fresher. His head was clearing. Up and up he climbed and presently with the shouts of the Hairy people sounding about him and willing hands reaching down toward him he was pulled up onto the shelf beside Ru and safety. Then he turned with the others to see what was happening. As he had hoped and expected the gorillas had followed him into the valley. Scrambling along they had all come through the narrow entrance and were swarming over the rock sides of the pocket and about the clear pool in the center. They came more slowly now, for they perceived that the Hairy men were at bay expecting their attack. But while Og and his companions, waiting on the shelf, tense and alert, watched them come they saw the foremost of the band, and those who had been in the pocket longest, begin to raise their heads and feel at their throats as if to throw off a mysterious hand that clutched them there and cut off their breath. They could see, too, fear on their ugly faces and consternation in their attitude. Soon others were acting queerly and ere long the entire band became fearful and panic-stricken. They did not know what the trouble was. They could not understand what treacherous, mysterious enemy was grappling with them. All that they knew was that some hidden force had suddenly robbed them of the power to breathe; to drink in the fresh air that their lungs suddenly seemed to demand with insistence. Some of them were growing dizzy. The Hairy men could see them staggering about groggily, until one by one they collapsed and with a few convulsive shivers lay still. Once they began to fall they dropped off like flies. Some of them screamed out in their agonies, some fought each other, biting, clawing, scratching; some stormed in a towering rage, clawing the air and threshing about with their long arms, some plunged or fell into the cool, still pool, and some of them just staggered about until groaning they sank down and lay quiet. It was a hideous sight to witness and Og and Ru and the rest of the Hairy men looked on in horror and forgot to cheer their victory. As for the gorillas, all attempts to attack the Hairy men were abandoned in the face of this terrible mysterious death that was upon them. None of them had intelligence enough to comprehend what it might be and so none of them had presence of mind enough to flee out of the valley, until a few sick and weak and staggering realized that never while they remained in the trees of the forest had such a disaster overtaken them and, all but unconscious, made their stumbling way toward the entrance to the pocket. But most of them collapsed ere they gained the fresh air once more, and those that did win past the entrance went down under the spears and stone hammers of the Hairy men whom Ru had hidden there for just that purpose. Og and Ru and the rest of the Hairy people lingered a long time on the shelf overlooking the pocket. They stayed until the last ugly huddled form on the shores of the clear rock-bound pool lay still. And then because the horrors they had just witnessed had cast a spell of depression over their normally buoyant spirits they slowly left the ledge on which they crouched and climbing the rocky sides of the old volcano made their way around the little valley of death and on toward the great cave where the women and children of the tribe waited in fear and trembling. And Og and Ru and the rest of them knew that now they could never return to their caves in the cliff by the river, for there were just as many, horrible mangled forms back there crushed under the stones as there were in the valley of death and the Hairy people could not live with constant reminders of these dreadful beings and the horrible fate they had met constantly before them. And so it happened that when a great council fire was lighted in the huge cave and the warriors and hunters had gathered about it to talk of things that were best for the tribe Og and Ru were appointed to go out and find a new home for the tribe to migrate to.